Throughout late 1882 and early 1883 Vincent van Gogh undertook a series of studies featuring "orphan men" (a colloquial term for Dutch war veterans). Van Gogh was living in The Hague and he sought, through drawing, a means to allow him to continually hone his evolving artistic skills. Inspired by a comparable series Heads of the People published in the English illustrated periodical The Graphic Van Gogh went on to produce thirty-seven drawings featuring these elderly men. The subject of this particular drawing is Adrianus Jacobus Zuijderland (also spelled Zuyderland) who resided at the Dutch Reformed Old Peoples' Home in The Hague. W.J.A. 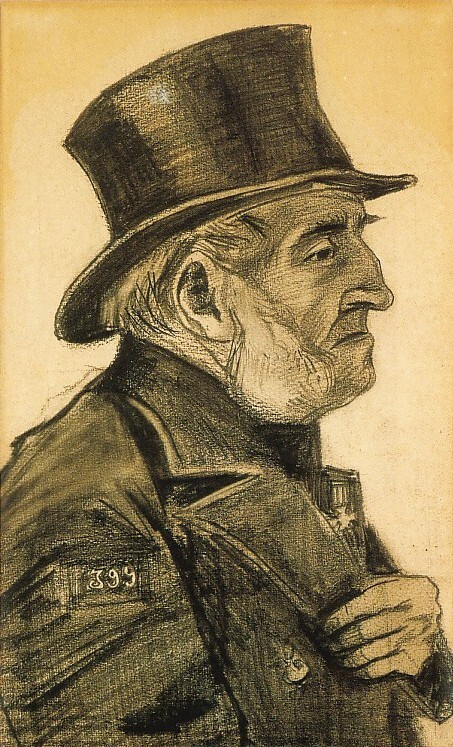 Visser noted the subject of the drawing was shown wearing an almshouse registration number of the arm of his coat. The stylized "199" lead Visser to discover Zuijderland's identity from the archives of the Old Peoples' Home. So I am now working on two large heads of an old man from the workhouse, with his wide beard and his shabby old-fashioned top hat. The old fellow has the kind of wrinkled, witty face that one should like to have near a cozy Christmas fire. Van Gogh's comments suggest that he not only enjoyed Zuijderland's character, but also his somewhat harsh physiognomy which would be a standard throughout Vincent's orphan man series. He would draw Zuijderland six times altogether: four in dress clothing (the present drawing and those three seen in Table 1) and two in fisherman's clothing (see Table 2). Van Gogh was pleased with his work on the men from the Old People's Home. Certainly the drawings from this series show a marked improvement over those Van Gogh attempted, say, a year earlier. His persistence paid off and his skill as an artist was truly coming to fruition. In early 1883 Van Gogh would use the same subjects--the elderly men--but now he wanted them to pose as weathered fishermen. With a worn sou'wester hat and a rain coat he achieved the desired effect. Though I have written you often, I am very hard at work. I cannot tell you how I long to speak with you about many things. Tomorrow I get a sou'wester for the heads. Heads of fishermen, old and young, that's what I have been thinking of for a long time, and I have made one already, then afterward I couldn't get a sou'wester. Now I shall have one of my own, an old one over which many storms and seas have passed. Vincent van Gogh had a great love for portraiture and he would draw and paint people throughout his career. In keeping with his life-long empathy for the poor and downtrodden, most of the subjects of Vincent's portraits are those less fortunate than most. Van Gogh's orphan man series as well as the fishermen drawings reveal stark contrasts: the worry-worn and harshly realistic faces of the subjects are coupled with a sympathetic and compassionate undercurrent that softens the severity of the subject. "Blessed are they that mourn, blessed are they that sorrow, but always rejoice, blessed are the pure in heart for they shall see God. Blessed are those that find love on their road, who are bound together by God, for to them all things will work together for their good." David Acton, Master Drawings from the Worcester Art Museum (Hudson Hills Press, 1998), p. 158. Sjraar van Heugten, Volume One: Drawings--The Early Years, 1880-1883, (V+K Publishing, 1996), p. 200. Gift of Mr. and Mrs. Chapin Riley in memory of Francis Henry Taylor.